Mass events that bring together tens of thousands of people in a limited time and space are great ways of telling how well prepared one or another Mobile Network Operator is for handling rapid traffic peaks. Although subscribers are more forgiving during mass events when it takes several attempts to make a successful call or send/receive/upload a photo, it can still leave a mark on the operators’ reputation and can affect subscribers’ future choices. There is also a general tendency of traffic shifting from voice to data – people are using more Instant Messaging applications like Skype, WhatsApp, Viber and are also making calls through these apps. Another trend is the upload of images to social media sites or even streaming live video either to friends and family or to social media like Facebook Live. All this means that when in normal operations the Downlink data volume greatly exceeds Uplink data, then especially during mass events the traffic distribution between DL & UL is equal or could even be leaning towards uplink. The goal of this White Paper is to give an overview of standard actions to be taken to grant the best possible user experience in any type of mass event. Experts in design and optimisation of mobile networks, 3dB consult offers design and optimisation services for mass events like concerts, sports events, festivals, arts events, etc. These services focus on improving the performance of both the indoor solution for the arena (if such is the case) and the outdoor coverage solution of the surrounding area. The aim of the services is to provide operators’ subscribers the best customer experience during the event as well as outside the event. 3dB consult has extensive experience in the field of sizing, preparation, optimisation and real-time monitoring of mobile networks in mass events. We have performed this type of service for several mobile network operators in different countries, always with highest quality and excellent results. To guarantee the best service quality 3dB consult has developed a proprietary tool for the operator to access the event statistics, as well as information about the actions being taken in case of degraded KPIs, easily and in real time. Preparation is key task to prevent network degradations. Preparation is started several weeks before the actual event takes place. With the preparation analysis and actions, we prevent potential problems as well as HW incidences, congestion problems in 2G/3G or 4G technologies or a network unsuited configuration. For this activity is very important to possess correct and detailed information on where and when an event will take place and what is the expected attendance. As part of the even management dimensioning and network review of all BTSs, NodeB’s and eNodeB’s involved in the event, special design inside the event arena and all nodes inside event’s zone of influence should be performed. With this study, the situation is evaluated and the operator receives a full report on the situation as well as actions to carry out. Level 1 with maximum attendance (Large). An event with more than 12,000 participants, e.g. a football match. Level 2 with medium attendance (Medium). An event between 6,000 and 12,000 participants, e.g. a music concert. Dimensioning rules and guidelines should be developed to be followed for each technology and for each event type and level. 2G dimensioning can be based on voice traffic Erlangs, data services blocking or both. The idle parameterisation should encourage users to stay in LTE, 3G and 2G (in that order). By parameterisation and functionalities, the balance between cells of the same technology is maximised. Voice services are prioritised against data. Coverage will not be reduced by modifying the CPICH power. For an operator to define suitable dimensioning and parameterisation rules, it takes some research, some theoretical calculations and a lot of experimenting. 3dB consult possesses all this knowledge only by having managed hundreds of events on a different scale throughout the years. There’s often the question whether network changes to handle mass event should be only logical (parameters), or physical (antenna tilts and directions) or both. As mentioned before, to achieve the best results each event should be considered as unique and network changes should be planned accordingly. It is extremely important to have consistency in the indoor and outdoor design to ensure indoor cells are covering inside and outdoor cells outside and that handovers from one to another are performed seamlessly, at the right signal strength and quality levels and at the correct physical locations. To guarantee everything works as per the design often site visits are needed to adjust the thresholds and to ensure outdoor cells are not interfering with the indoor cells and vice versa. 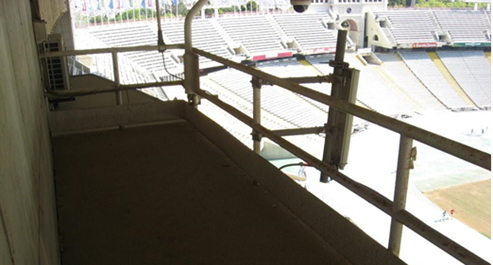 For indoor solutions such as football stadiums, parking garages, business or commercial areas, the physical design tends to be complex due to space limitations and possible shadow areas that should be always omitted. These limitations make the physical design critical! In most cases a combination of dipole antennas, panel antennas and omnidirectional antennas should be used with the correct power limitation and azimuths/down tilts in case of panel antennas. It is not unusual, especially when there is not enough space for the installation, that shared physical elements (antennas, feeders) must be used. Physical sharing can be both, between same operator’s different technologies or between different operators’ technologies. In these cases, specifically selected combiners, diplexers/triplexers must be used, adjusting the physical system to compensate the extra losses and electrical delay, that sometimes must be corrected with the installation of amplifiers near antenna, for example tower mounted amplifiers. As part of the Base station design, initial logical design must be defined according to expected capacity, power and resource demand. In case of a mass event it is extremely important to prepare a precise traffic estimation for triggering the necessary support actions – ordering licenses to increase the capacity based on the traffic forecast, increasing resource availability or setting guidelines for the proper distribution of the resources. On top of the network physical and logical design it is equally important to make use of the high capacity and access storm handling features that are available for the particular vendor equipment. Again, these features are not universal, so while some generalisations can be made and common sense can be applied it is still imminent to trial (test) the behaviour of the feature using different parameter values. Following is a list of aspects to be reviewed as minimum for different mobile technologies when deploying high load scenarios. 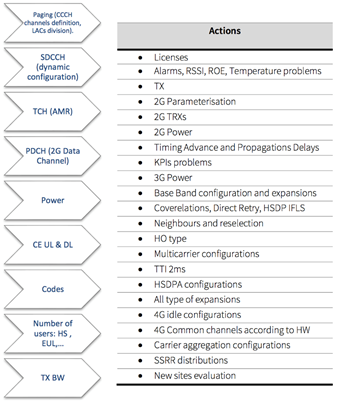 SDCCH channels (Ericsson) and PDTCH, SDCCH channels (Huawei). Just as important as the preparation phase is the KPI monitoring throughout the complete duration of the mass event. It is extremely vital not only to monitor the KPI’s, but also to be ready to take corrective actions in case of KPI degradations. It is not uncommon to have to adjust parameterisation during the mass event, because traffic profiles can differ or alter from one event to another or even during the same event. As part of 3dB consult mass event handling service all unexpected problems and degradations that affect the quality during the event are solved instantly. 3dB consult owns a proprietary tool specifically developed for real time performance monitoring that allows event KPIs monitoring in real time. The EMT (Events Monitoring Tool) allows real time network monitoring, analysis and reporting. The 3dB consult EMT provides two views: Management & Technician. Major focus is put on nodes with greater impact on event area. 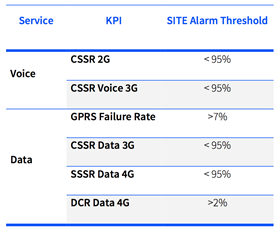 Whenever one of the KPI alarm thresholds defined at Site level is reached, the related 2G & 3G & 4G recovery actions & process tasks are taken to recover the degradation on impacted sites. Once the event is over and pre-event settings are restored, it is common to deliver a report with all changes applied during the event, different from the pre-loaded configuration/ parameters/features settings. As standard, the report includes degradation level and time information as well as actions type, value and the time when changes were loaded in the network. Also, a post mortem analysis is prepared which includes KPIs evolution and degradations, degradation causes, outside factors or external causes’ identification and possible improvement actions to be implemented in the same or other events for the future. Comparison of the KPI values achieved in the event will be done against reference (same event on previous year, a similar event at the same site during the current year and the same period in the week before the event) and against the quality objectives defined for the event. Statistical indicators are based on the main KPI and always oriented to customer experience: availability, CSSR, DCR, blocking traffic and throughput. The post mortem analysis should include a feature impact analysis and proposals for improvements. •2G/3G/4G – Hourly KPI: A separate sheet for each technology including Availability, Traffic, DCR, CSSR CS and PS, Block rate, Congestions Failures, TPUT, Users. •2G/3G/4G – Daily KPI: Day aggregated values. 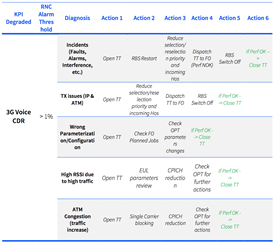 Adjusting network settings to match the expected traffic profile of mass events is a must for every operator who wants to ensure best user experience for their subscribers and most efficient network usage during these events. It is vital to study the traffic from previous years and to estimate the actual number of participants to be able to manage the network changes correctly. It is recommended to have several ‘standard’ event configurations based on the expected number of people attending the event. This ensures that a similar approach is taken every time event preparations are made. Procedure standardisation allows to deliver network optimisation with best quality, to have continuity in the process and to draw conclusions from the optimisation changes executed.